Here is a video I did a long time ago and over the years I've received countless messages that this video has helped many frustrated people. If you are struggle with the magic circle my hope is that this video will help you too! Why the magic circle (ring)? 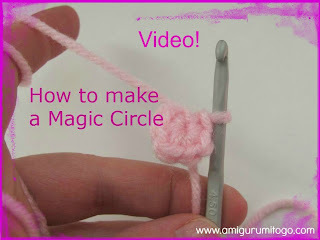 The magic circle is a clean way to start amigurumi. It is also known as the adjustable loop or adjustable ring. Also subscribe to my youtube channel to get new video tutorials as they are uploaded. thanks for sharing!! good video teaching! I love love love your videos! They're SO easy to understand and straightforward! I just have one thing though... Right when I pull the circle closed and want to pull the tail, the yarn gets all undone-ish. Like pulling the tail makes the yarn get stuck so I'm pulling out some of it and the rest just kind of jumbles together :c! Is it my yarn?? I'm using Red Heart worsted 4. Is there any yarn you recommend the most?? Hey thanks for that amazing tutorial. Especially the six point star. Great help.